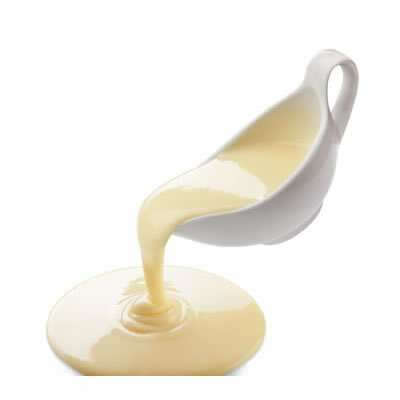 Condensed milk is a sweet and thick dairy product used in many desserts and drinks. Condensed milk is a sweet and thick dairy product resulting after the evaporation of water from pasteurized milk. Condensed milk, also called sweetened condensed milk, is the sweetened form of evaporated milk. If produced and canned appropriately, condensed milk has a shelf life of around two years without refrigeration, which is much longer than that of most dairy products. Making condensed milk is a fairly simple process, however it does require specialized machinery, so it is not common for home cooks to make. Milk is first pasteurized, and then put into a condenser. This machine has low pressure inside, which allows the milk to boil at a lower temperature. In doing this it is possible to remove around 60% of the water in the milk without scalding or burning it. After the milk has been evaporated, sugar is added to a level of about 45% of the final product. This is then canned and sent to stores for sale. This process makes milk thick, like syrup, and extremely sweet. Also, by concentrating the milk and adding sugar, it becomes calorically dense. Gale Borden Junior in the United States is recognized as creating the industry of condensed milk. A French dairyman first condensed milk in the 1820’s, but the process was perfected by Borden in 1853. He used a process similar to condensing juices on milk, and after much trial and error came up with Eagle brand condensed milk. This condensed milk gave wide access to dairy products to people who were not close to a cow. Borden’s business grew dramatically during the civil war because there was a strong need for soldiers to have nutritious and high calorie foods that they could take with them. After the war, the demand grew rapidly for condensed milk, which leads to a large number of creameries opening in the United States and Canada. However, the supply quickly out grew the demand, and in 1912 many creameries had to go out of business. World War I again sparked interest in large amounts of condensed milk for rations in soldier’s packs. Today, condensed milk is used in many desserts and drinks all throughout the world. In England and many parts of South East Asia and China, condensed milk is added to tea or coffee for additional sweetness and flavor. It is also used in place of jam or jelly in many countries on toast. Many Latin American dishes feature sweetened condensed milk including tres leches cake from Mexico, and brigadeiros and pudim from Brazil. It is also common to place cans of sweetened condensed milk in a double boiler, causing it to turn a rich caramel color. This product, called dulce de leche, is used widely throughout Central and South America, as well as in Russia.